Fabio has quite a unique history along the Emerald Coast, stranding four times since 2009. Fabio’s most recent stranding was caused by a boat strike damaging the back half of his carapace. The green sea turtle was found abnormally floating near the jetties on Tuesday, February 28th 2017. FWC responded and transported the turtle to Gulf World Marine Institute. It didn’t take long for the animal care staff to recognize the sea turtle, Fabio, a former patient. The unique identifier was the amputated front flipper which was later confirmed by scanning for a PIT tag (animal identifier similar to a microchip). Fabio stranded in April of 2009, entangled in fishing line and was taken to Gulf World for rehab. The animal ingested the fishing line and the severity of the entanglement around the front flipper made it medically necessary to amputate. The sea turtle was released in 2010 in Gulf Breeze. Fabio showed up later in cold stun events in 2011 and 2014 in Santa Rosa Sound and Perdido Key respectively. Gulf World released the animal in 2014 at Cape San Blas. Despite a flipper amputation, Fabio has been thriving and traveling the panhandle until his most recent boat strike incident. Both western and eastern medicine practices were used to treat the animal’s wound. The therapy regimen included cold laser therapy to reduce inflammation and the use of local beeswax donated by Tupelo Beekeepers Association to heal his carapace (top shell). 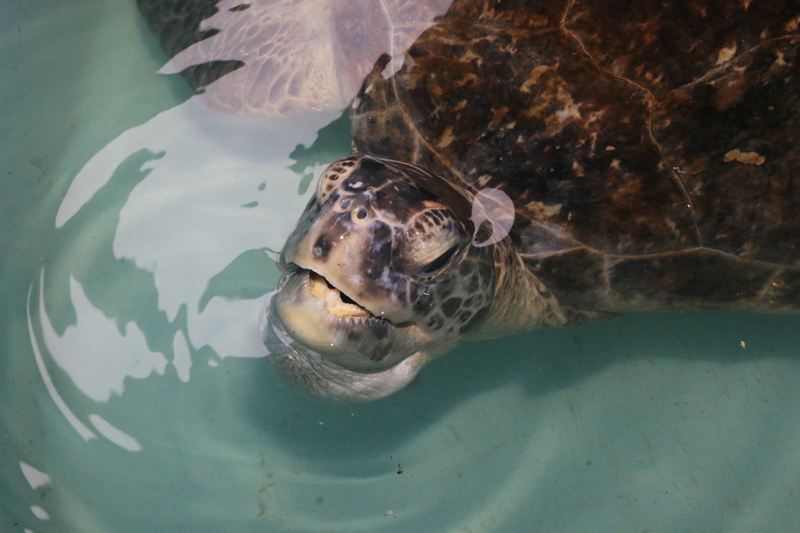 After nearly 12 months of rehabilitation, the bone structure of the carapace was healed enough that the animal was medically cleared to be released into the Gulf of Mexico on February 21st, 2018.